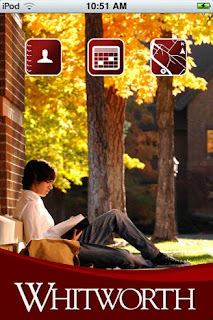 Whitworth University has released its first application for use on the iPhone and iPod Touch, now available at the Apple iTunes store. The free app, called iWhitworthU, offers easy, instant access to the university by helping users navigate the campus, connect with faculty and staff, and stay up-to-date on campus news and events. The new Whitworth app includes a searchable campus map that allows users to look up building information; a campus events calendar that can be bookmarked for easy reference; a directory that allows users to connect with faculty and staff via e-mail or phone and to store contact information; and a campus news listing service. "Whitworth is committed to using new technologies to connect with our constituents," says Garrett Riddle, acting director of communications at Whitworth. "Mobile devices are changing the way our society communicates and accesses information, and our student-programming team has helped us establish a new communications foundation that we hope to build upon in the future." Work on the application began in February as a group project for a software engineering class taught by Keith Knapp, a visiting faculty member in Whitworth's math & computer science department. Students involved in the project included Thomas Hamming, Kayla Lewis, Scott Pfursich, Matthew Wilding and Ian Zuck, all of whom graduated from Whitworth last spring. After the class concluded, Hamming volunteered to continue developing the application this past summer. University web programmers Tom Ryan, '09, and Dallas Crockett, '08, and web designer Zac Jones assisted with the design and functionality of the program. The application was submitted to iTunes for approval in early September and went live Sept. 22. "When I was a student, iWhitworthU was a great computer science project for me," Hamming says. "Now that I’m an alum, it gives me a great way to stay connected with Whitworth." To download the app, visit the Apple iTunes store at http://itunes.apple.com/app/iwhitworthu/id392065981?mt=8. Whitworth hopes to add new features to its suite of Apple applications in the future. The university has a beta site for other mobile devices available at www.whitworth.edu/m, and it is looking at developing a suite of Android applications. Garrett Riddle, acting director of communications, Whitworth University, (509) 777-4784 or griddle@whitworth.edu.